New Year is around the corner and we want to celebrate it with you by having our traditional snowball game! Load your catapults with snowballs and let's fight a snow fortress! Will there be the lucky one who'll get the super-prize - a chest with 300 gold? Here is a board which looks pretty much like the one we use for the chess. We hid some prizes under some of those fields. All you need to do is just choose randomly ONE field and post your answer in this thread (for example F3) till the 10th of December 2018 14:00 GMT+1. Then we'll unveil the prizes. 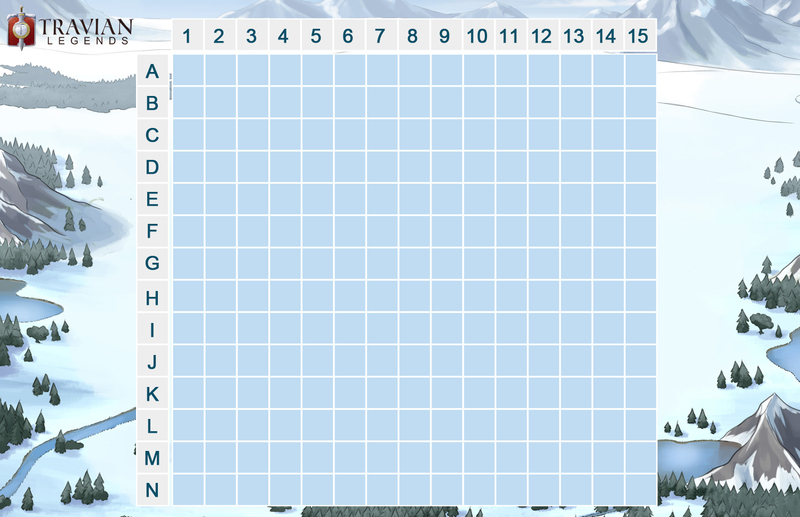 Don't forget to write your in-game nickname and game world together with your answer. You may post here only ONE message with ONE coordinate. The other messages will be deleted. The main prize (300 gold) can be won only once – the first player who’ll post the correct coordinate here, will get a voucher worth 300 gold. All other prizes can be won several times by different players, if they choose same winning coordinate. 100 points daily reward can’t be given on a server that lasts less than 10 days and on Tournament finals. You can exchange it for 30 gold voucher. Post your answer by replying to this thread. Post was edited 2 times, last by Stellamini ( Dec 5th 2018 ). Post was edited 1 time, last by Drudez ( Dec 5th 2018 ).